From the lovely Lily, Loam's resident earth spirituality columnist (doesn't every magazine have one?) comes a powerful essay on the delicious act of doing "nothing." For more thoughts on inhabiting the present, check out Alison Znamierowski's fantastic photo essay on being a neighborhood naturalist. So much good stuff to sit and soak up today. A few weeks ago I had the flu. While it was fun to watch endless episodes of Gilmore Girls, after a few days of this I started to feel a bit like a useless lump. When I began to recover, I took a slow and sneezy walk to nearby Prospect Park. On the way, I listened to the audiobook of Bill Bryson’s “A Short History of Nearly Everything.” I ended up literally walking in circles, engrossed by a particular passage about lichen. Lichens, I learned, don’t do anything. They just sit there and grow very, very slowly. They may take thousands of years to grow just to the size of your face. They don’t lead what we’d think of as exciting lives. Or, as Bryson writes: “It would be hard to imagine a less fulfilling existence.” Lichens sit there, and continue to sit, clinging stubbornly to a long and sedentary life. The lichen’s one M.O. in life is just that: to be in life. And while I’m not suggesting that we all go quietly sit on a tree for the rest of our days (I’m much too hyped up for that), there is something to be learned from the lichen’s total lack of purpose, its unconditional love of life. We humans assign “purpose” to everything. We ascribe constant trajectories to our lives: school, graduation, career, family, achievement, milestones, etc., etc. As a culture, we’re obsessed with goal-setting, self-improvement, and pursuing our next desire— and we judge our lives based on these rules and trajectories that we’ve made up. To a certain extent, of course, goal-setting is useful. Purpose can be a wonderfully fulfilling concept. But what if we let go of some of the obsession with purpose? What if we let ourselves live like the lichen— living just to be here? After all, we are just animals. We are living, eating, peeing beings who are here for a limited and unknown amount of years. We basically just want to keep eating and peeing for as many more years as we can. It can feel good to have goals and a purpose. But that type of thinking can become so extreme that we feel inadequate or panicky when we’re not constantly achieving those goals every single second. When I had the flu, I felt like I was wasting time and not accomplishing anything. I was just sitting in my bed watching Lorelai and Rory banter. But what’s wrong with that? What if we subscribed to the radical notion that each moment is a worthy moment, just as it is, simply because it is? To live like a lichen is to release the constant pressure we’re taught to put on ourselves. To live like a lichen is to feel the actual sensation of each moment, whether you’re running around crossing things off your to-do list or just sitting on your bed. 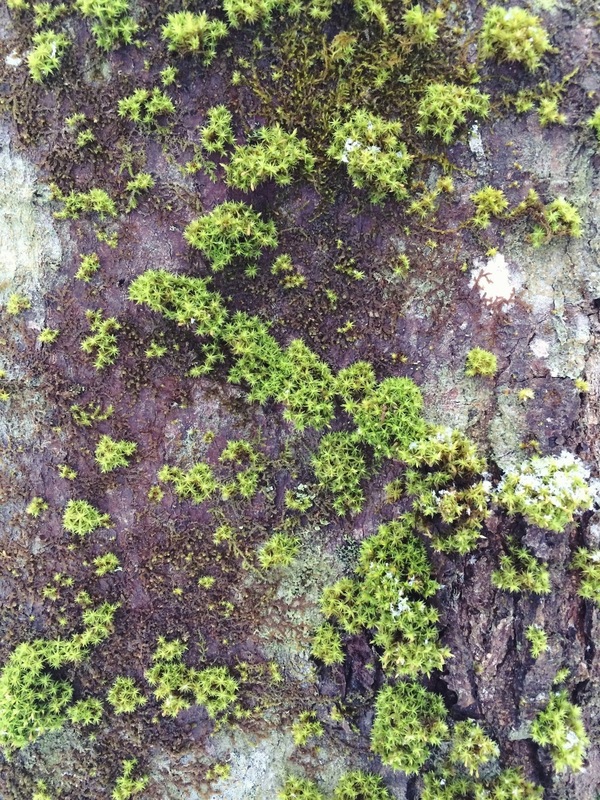 To live like a lichen is to judge neither moment as “better.” They’re both just moments. And as a lichen, you want all the moments you can get. This focus on breath is what’s drawn me passionately to a yoga practice. The beauty of yoga is that it’s never about how “well” you do a pose. It’s not about achieving a certain outcome, or forcing your body into a pose it’s not ready for. It’s all about the breath. My favorite yoga teacher always emphasizes that in your final expression of any pose, the breath should be slow. If you’re pushing yourself past the point where you can breathe fully, you’ve gone too far. Yesterday, I was walking hurriedly through Manhattan’s crowded sidewalks, nervous about time and inexplicably anxious about several disparate things. When I get anxious, my breath gets short; my doctor told me it’s called “air hunger.” The faster I walked, the worse it got; I couldn’t inhale deeply and my breath grew more panicked. Then I realized: there’s no need to walk so fast. “If you’re losing the breath, you’re walking too fast,” I told myself. And I slowed down. It felt uncomfortable to slow down, because I like getting places quickly, but it also felt newly, weirdly good. It was a declaration that my priority was the breath and nothing else. I also implement this by reminding myself that I don’t have to have an opinion about every moment. The moment is arising; I can just let it arise. When I wake up at 5:30 for work, and the prospect of making bagel sandwiches for 7 hours is wildly unpleasant (oh, the glamorous life of a bagel shop barista), I remind myself that all I need to focus on is the breath. I don’t have to have an opinion about going to work. I can just get up and go, trusting the inhales and exhales to take me through this particular moment as they’ve taken me through every other moment I’ve ever experienced. I have a friend whose constant mantra is, “I’m happy just to be here.” I’m not always happy, but I am always here. What would it mean if your only job is to be present? For me, it’s enormously comforting. And the good news is that here is the easiest place to be. Present is the easiest thing to be. Because we’re already here. We don’t have to be anything, anyone, or anywhere else. It only requires the breath. Inhale, exhale. Good. Now keep doing that forever.